Here are pictures of the draw for "A Girl Called Jack"
As Adam was here too he had to be involved. He folded the name slips and put them in D's best Panama. If you email me on frugalinderbyshire@gmail with your address Diane I will post it out a.s.a.p. Welcome to Donna on the Follower's side bar and to Lisa, Susan, Liz and Mrs Rosemary Vernon (very formal) on Bloglovin. I can see who most of your are now. We have finally had some rain, which has two major benefits for me, the veg are getting a good watering and I have finally done a spot of housework. I realise that the house has got so bad that I will be hiding if anyone comes to door, pretending there is no one here rather then invite them in! So I have got started. I have blitzed the big lounge and the bathroom... That should cover two bases anyway. We have another wildlife issue. I could see those lovely red fruits under the netting beckoning me to pick and make a spot of jam. Slugs can be an issue as can blackbirds, but straw and netting tend to help deter these critters. What they don't do is deter.... Moles!! many of the plants are now sitting on top of dry mounds of earth. I pressed the mounds down and gave them a good watering, but some roots had become very dry before I noticed them. I also notice that there are two dead moles on the garage base, courtesy of Dixie Doodle. Here is a pic, which actually doesn't show the damage too well, but you get the idea. I did manage to pick enough to make four pounds of jam. it isn't the highest yielding jam, but IS very popular. I used gooseberry puree to help set it as the redcurrants aren't ready yet. Talking of jam, I have just finished a book that YD bought be for my birthday. it is about the role of the WI in the second world way and is called "Jambusters" I think this is a naff title that belies the content and makes me want to sing "Who you gonna call?....Jambusters!" . It took me some time to realise that as it was a book about the war it was probably a play on "Dambusters". I was surprised to read of the many tasks set by the government for the WI of which jam-making was just one. It was interesting to see how little respect there seemed to be for the organisation initially. The respect grew, but the role of the organisation wasn't always recognised. The pictures on the cover could be my mother and sundry aunts! Altogether, I really enjoyed this book, which means it won't go into the CS pile and is a "keeper"
Here is the book with that famous bookworm (and mole catcher) Dixie. Adam will be with us this weekend. Looks like it might be a rainy one so will need to think of some wet weather tasks to do together. That reminds me I need to make his bed up! All for now frugal friends. I shall be asking my granddaughter to draw names out of the hat for the "Girl called Jack" book on Sunday, so if you want your name in the aforementioned hat there is still time to join the raffle. You don't have to be a follower or anything. If you read this blog that's good enough for me! Non the less welcome are some new followers on Blog lovin. Unfortunately, BL is playing up and won't tell me who is following, just how many are. So whoever you are... Welcome... and I will recognise you properly when BL gives of his secrets. This bee business is getting ridiculous. I went to look at the bees under the eaves (last post) and they were indeed honey bees (they weren't sure). they were also in an extremely difficult situation. It appeared that some of the bees were in the wall cavity of the farmhouse and a goodly size clump was hanging outside. they were fractious, probably because their situation wasn't ideal and also because it was hot and humid. It was quite difficult to approach them even to take a pic from underneath and they were a couple of floors up. The poor farmer's wife had gone outside and been followed back into the house by several insistent bees and was refusing to come out again. Clearly these bees were a nuisance and couldn't be left where they were. This causes difficulties.. .how to move them ? if indeed that were possible. I wondered if the local beekeepers association would tackle the swarm which was very high in the eaves and couldn't just be swept off, as an unknown quantity (including the Queen?) were inside the wall and couldn't be reached. I told the elderly farmer that I would try to find some contacts for him as we would not be able to collect it. My first port of call was the council's environmental health pest control dept. Apparently they will dispose of anything but bees ! I told her that they were a nuisance and could not be left and may even (probably) have to be destroyed.She told me that bees were protected and that it was illegal to kill them . I informed her that sometimes this was the only thing that could be done and you COULD destroy bees who were putting people at risk. She put the phone down on me! With the help of good old Google I found the local bee swarm collectors, who will undoubtedly NOT be able to collect the bees for all sorts of reasons, in particular, not being insured for high ladder work for starters and the position of the swarm within the wall cavity. I suspect that this poor couple will have to find a private pest control expert to help. All this information I gave to their daughter who will be helping them with the calls. I do hope they sort them. This evening, as though I wasn't "beed-out" enough D. and I decided to look through the vast swarm that we had collected on monday.. It was indeed HUGE, filling all the frames. We put a super on it to give them more room . We were particularly pleased to find and mark the queen. We decided that as we were togged up we would look through a few of the other hives. As we were approaching the hive at the far end of the garden our neighbours from across the road, who were having a birthday party for a one year old, shouted over " You are collecting the swarm then?" "Just looking through the bees" we replied naively "Well, it's been there all day, we thought you were going to collect it and we were all hoping to watch" they shouted across the road.... " !?!? " we replied , or something along those lines. There in the apple tree was a cluster of bees. "For goodness sake.. give us a break" I thought. What we said was "Thanks for telling us about the swarm. Of course you are welcome to watch" For the next half an hour the birthday party lent on our front wall while we boxed the bees, cheering as they were knocked into the box.... Box No. 13 !!! We finished selling last years'honey yesterday, so took the signs in. People were still knocking today as they had seen the signs which have only been up 10 days. We told them that we would be spinning in a couple of weeks and to watch for the new signs. Is it possible that the bees will actually make some profit for us this year? if so, it will be the first time in 40 years of beekeeping! I PROMISE not to post about bees again now for some time. You must all be sick of hearing about them, but they really have been taking up so much of our time that they do have to be mentioned. Talking of signs and selling from the door, we put up signs for our excess produce and leave whatever we have on a slab at the front of the house with an honesty pot for money. I have lost count of the people who come to the door, insisting on giving us the money saying " I didn't like to leave the money there for someone to steal it" I always ask them if they would steal it? to which they usually reply with horror "Of course I wouldn't" "The majority of people are just like you " I tell them and in thirty three years we have never been short in the pot, with some people leaving more money than they need to"
Does anyone else have a different or similar experience to this? Still busy here. Have finally finished planting, just some plants waiting in the wings for when the garlic and spinach come out in the next couple of weeks. Still picking gooseberries and now cucumbers. Last week we went out five nights out of seven and I am happy that this week will be less "social" so that perhaps I will get some sewing done in the evenings after I settle down. Still using up food from freezer as the older one is about to give up the ghost and I need to ensure that the remaining one has room for the summer produce. Not that we freeze ,many veg as we like to use veg in season and find frozen veg not a patch on what can be had straight from the garden. Leftovers were ..Chicken salad monday, Chicken pie for next weekend when Adam is here, Chicken soup for lunch and enough for three rounds of chicken and stuffing sandwiches. Had the most enormous swarm on Monday. YD spotted it through the window leaving Hive No.1 It settled high in a tree. Bob (Shared Lives) held the ladder which D. climbed and tied a chord around the branch and then cut the branch and gently lowered the swarm down while I steered it into the box. A good swift knock and they were in! They are covering most of the frames so there's a goodly few. Still haven't sold any bees yet, but we should be collecting honey in a fortnight which is good as we sold the last of our honey store yesterday! Kev.. Tidy I am not. My excuse is that my head is full of highly intelectual and creative thought, leaving no time for the mundane. In reality I am a VERY untidy person and so is D. so we stand NO chance! have much more to write, but just received a phone call from someone who has bees in there eaves .. can I go and have a look? Another sunny day here and I'm worn out! When it is good weather I work outside, knowing that it could turn to rain at any time. However we haven't had any rain for some days now and the house is getting untidier, with jobs piling up while I continue with outdoor tasks, which are never-ending and now include watering too. I almost wish it would rain so that I could scuttle indoors and do a spot of houseworky stuff ! Those who know me will be shocked at me wanting to do housework. Despite the time spent outside we have struggled to keep on top of the gardens this year (how tall are those weeds?!). Currently we have a large garden to the front of the house, which has perennial flowers, a lawn, a greenhouse, four growing boxes and eleven beehives. To the rear of the house we have a large greenhouse, three vegetable patches, a small orchard which also houses most of our hens and a garden that we call the fruit garden which also has a small lawned area and large tables where we eat as in "The darling Buds of May"! Going away from the gardens and towards the river is the paddock of approx one and a half acres, which we are having to cut as we don't have enough lambs this year to help keep it down. We have decided that we will turn the vegetable garden that fronts the paddock into a soft fruit garden, which should be easier to manage than a veg plot. I have been striking new plants for a couple of years now which I intended to sell, but shall use them to stock this garden instead. We sometimes forget that we are no longer in our thirties, which we were when we moved here. You know how it goes... you walk past a mirror, have quick glance and think "Who is that old crone?!" D. is the big 70 in a few months time and I am 68 and we do pretty well on the whole and are certainly not ready to leave our little corner of Derbyshire, so I guess we need to try to make things just a little easier. Over the last few weeks for one reason or another we have been providing Doggy Day Care for our daughters and granddaughters' dogs. Today for the first time we haven't got a dog on the property and we can leave gates open and the cat's food on the floor.! 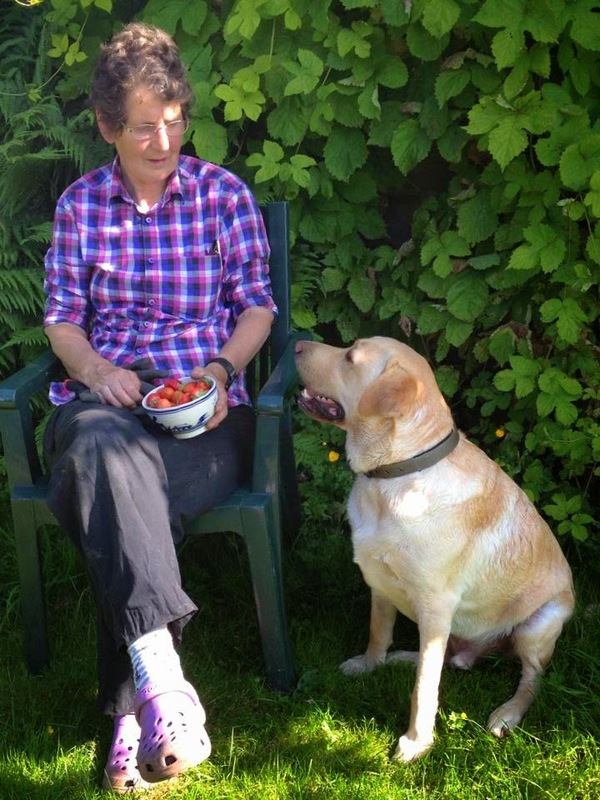 Here is a pic, taken yesterday of me and our granddaughter's dog Coda, who is a sweet boy but, as all Labradors, very food driven and thinks he would like a strawberry. We had a a meeting of the Civic Society last night, which went pretty well. After the meeting D. and I went to a local pub to watch the second half of the England game. How much are they paid ?!!!! And as for those b****y trumpetty things that are all the rage! This weekend saw our first cucumber. By "our" I mean YGD and myself. She started the seeds off in the front greenhouse on 8th March, which I potted into the main greenhouse. Here she is proudly showing it off. I have finally managed to get the leeks planted. I started them off in a cold greenhouse 6th February. This is how I prepare and plant the young plants. I am sure many of you do the same, but this is for virgin leek growers . I made the holes with a stick as I couldn't find my dibber, but the old blokes tend to use a broom handle so that there is less bending. As promised, here are my simple recipes for Carrot cake, Date and Walnut Cake and Mincemeat Cake. Pour the mixture into the tin and bake for 25 - 35 until firm to touch. How you decorate the top is up to you. Some people make a cream cheese topping. I make a simple glaze with grated orange peel, orange juice and icing sugar. Add to the cooled mix..
Hope these turn out well for you. These are all favourites for teas and gathering and go down well on cake stalls, with little effort. Hello All from a very sunny Derbyshire. Hello to two new followers on Blog lovin, I'm afraid I can't work out who you are, as new peeps are usually at the top of the list, but on this occasion aren't! (will I ever understand it or indeed Feedly?!) Anyhow, lovely to see you here. This week I have been planting, planting and then I have done some digging and then more planting. In between times I have been picking goosegogs. Spiteful little blighters they are too. Much of the planting is actually RE-planting as we have a surfeit of wildlife here this year. Someone asked me the other day if I was watching Springwatch? Err No I'm getting pretty damn fed up of the little critters without listening to someone waxing lyrical about foxes and rabbits! They could set up their cameras here, they wouldn't need a hide or to whisper into the lens of a special camera in the darkness. The wildlife here puts on a show in the bright sunshine while blowing raspberries and sticking up two fingers! As you know the fox has helped himself to a chicken or two and has been seen several times looking us straight in the eye, during the day. The pigeons have taken several dozen brussel and cauliflower plants back to the soil and those dear little fluffy bunnies have eaten the pea rows down to a short stubble. I have no idea who has taken the young sunflower plants or nibbled the tops of the onions. And as for cherries, yes I know jackdaws and jays are magnificent birds, but really!!! We took the bull by the horns and have actually advertised some bees for sale. This is the first time we have ever done this and I feel a little anxious about it as it is not exactly like selling the aforementioned goosegogs! We went sea fishing last weekend. Well D. did and I spent the weekend trying to find replacement Brassica plants. The fishing wasn't great again, but he did bring back two fine, large pollack. I left one for our friend as part payment for our lodgings. I have been asked for recipes for some of the cakes I make for the "dos" the Civic Society organise. I am pretty sure that I will have shared them somewhere here over the last couple of years, but I shall set down the recipes for my carrot cake, date and walnut and mincemeat cake in my next post in case anyone is interested. I notice that I have nearly a hundred followers on my side bar !! (not to mention all the blog lovin and feedly folk) I am amazed ! As a regular, but not frequent poster, who has never courted numbers or tried to be popular (you guessed!) I am SO surprised.. Thanks to everyone who reads my posts and makes comments. I never thought I would say this, but many of you feel like friends. How about this? no post for over a week and then two in two days! Wednesday went very well indeed. I got to the hall an hour early to set up when the first visitor arrived! Throughout the afternoon there was a constant stream of people, with some stopping for the whole three hours. The little hall car park was really struggling at one time. Mid afternoon I had a quick head count and there were sixty people chatting away, with some gone and some to come. While we were able to collect many memories, stories and photographs for our November exhibition it was clear that the overwhelming success of the afternoon was the social aspect. Some people hadn't seen each other since the closure of the wireworks in 1995/6. There was much hand shaking and shoulder slapping ( they were mostly men!) and folks had so much to say that the noise was phenomenal. What a great event ! You will not be surprised to hear that many attendees asked when we were going to host another! mmmmmmmm not really in our Society brief.. but why not ? There are few enough community events that generate such interest. Just been down to check on the hens and I can hear peeping. I hadn't reckoned on any hatchings this weekend. Looks like YD will be on chick patrol again while we are away. ooooer J. sorry! Just been looking at Kev's post and his chive rust. I have taken a pic of the rust/blight-whatever on our quince in the orchard. What does everybody think? Should we dig it out? D. managed to get the mower working . Hurrah. We looked at replacements and everything that did what our trusty machine did cost around £2,500 !!! GoDS did a spot of welding, D did a lot of fiddling, grinding etc. and we are just back from picking up a new belt as the present one is a bit ropey. Here is a pic of the paddock two thirds cut. As you see we were on the way to hay. All for now. Off to pack for our drive to Cornwall tomorrow as we are pretty busy tonight. Thanks for reading my increasingly random posts! It was a lovely day yesterday here in Derbyshire. Which is not what we were expecting after the weather forecast. YGD stopped overnight on Sunday night and has done quite a bit to the piece of garden we have allocated to her. She has planted the plants she started a few weeks ago. So far she has planted tomatoes, sunflowers, chillis, onions, french beans and basil. She also helped me start some baking for a meeting that our Civic Society is hosting on Wednesday. We made carrot cakes and mincemeat cake and gingerbread men (for her of course!) Today I am making , date and walnut cake. and lemon drizzle cake. Some one else is making a couple of Victoria sandwiches. As you may have gathered that was yesterday ! I still don't seem to have time to do this blog justice at the moment and now I am racing towards our "function" this afternoon. In brief, each November , as part of the Derwent Valley World Heritage Site Discovery Days we stage an exhibition and take walks around our area, highlighting the rich industrial heritage. Each year we attempt to ring the changes at the exhibition to keep people interested and spotlight something new. A few weeks ago one of our members suggested that we highlight the local wireworks that closed in 1996. We have been gathering oral histories for some time now and thought that we would do something similar with the wireworks. As many of the ex-workers are now elderly we thought that a get-together might be a pleasant way for them to share their memories while providing a rare social opportunity (not much happens around here!) This afternoon between 1.30 and 4.30 we have the village hall and have put posters out and sent messages to people who either worked at the wireworks or had a relative who worked there, to come along for tea and cake and a chat. We will see what happens. There might be three people turn up or thirteen, but we need to be ready for whatever happens (it is chucking it down which doesn't bode well). So cameras, dictaphones, papers and pens, display boards etc are ready for me to take round. And of course - tea and cake ! We are off to Cornwall fishing again this weekend. We will drive down on Friday (my birthday) and come back on Sunday, just a quick trip. I suppose the family will call round on Sunday as usual and that will be another weekend gone. Time really is flying. it gets like that as you get older! Bye for now, sorry about the rubbish totally non-frugal/self sufficient post I will try harder next time!